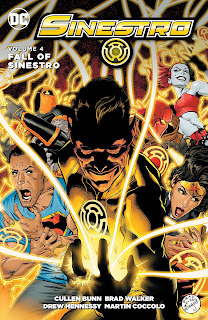 Much like Charles Soule's Red Lanterns, Cullen Bunn's Sinestro series climaxes with a battle royale worthy of its own DC Comics crossover; Sinestro Vol. 4: The Fall of Sinestro is a fitting end to a series that might've started slowly, but ended superbly. Like Red Lanterns, however, Sinestro peaks a few issues before its actual end, and the result is a great finale followed by a couple issues where the book peters out on the way to a hurried ending. But at ten issues, Fall of Sinestro is still a nice, and nice-sized, trade, including even when it didn't have to the final two issues of Bunn's mostly-unrelated Lobo series. The most important thing is, Cullen Bunn handles Sinestro well here, as well as Geoff Johns did before him, and he sets a high bar for handing Sinestro back over to Robert Venditti and the Rebirth Green Lantern team. Two of Geoff Johns's trademark characters have been Sinestro and Black Adam for much the same reason, that Johns wrote them as the perfect anti-heroes with just the right mix of villainy and honor. Bunn bites off a lot in writing a teaming of the two, but with great risk comes great reward; the first chapter positively sizzles, from the Sinestro Corps's brazen entrance to Kahndaq to Black Adam's halting reception, to Black Adam leading a lone Sinestro deep underground to the supposed crypt of their mutual enemy. Every handshake and kind word between Sinesto and Black Adam drips with bemused mistrust (perfectly rendered by Sinestro's Brad Walker and Green Lantern legend Ethan Van Sciver), and in the end I took away nothing from this book so much as that I'd read a Sinestro/Black Adam team-up book forever. Things just double and triple on themselves from there -- that the anti-emotion cult the Paling is lead by a disgraced Guardian; that Sinestro and Black Adam then team up with Wonder Woman (because of course they do); that Adam, Wonder Woman, and the DC You "Truth" Superman among others become Sinestro Corpsmen; that the Sinestro Corps and especially the beastly Arkillo become Earthly heroes; that Sinestro sacrifices himself and then his daughter, the former Green Lantern Soranik Natu, becomes head of the Sinestro Corps, and on and on. The first five chapters of the book especially are just filled with cool, unmissable, stand-up-and-cheer moments; there was a lot of build to get to these issues, but Bunn delivers in the end. What follows has a lot of promise. Soranik Natu is a Green Lantern favorite, still feeling like a seemingly new character though over ten years old at this point. Again, kind of like Charles Soule's Red Lanterns -- which featured Guy Gardner infiltrating the Reds -- the idea of "good" Soranik having to learn to manage the "bad" Sinestro Corps could be really great, though Bunn falls too quickly on "overwhelmed woman trying to do too much" tropes. Given three issues, we do get more of a conclusion to the book that one might have expected (certainly more than Lobo gets), but it's rather rushed and contingent on the Red Lanterns suddenly delivering a McGuffin to the Sinestro Corps. Soranik is certainly deserving of her own book and one of the best things about Sinestro has been the spotlight she's received, though late in Sinestro Bunn has Soranik calling Sinestro "dad" when she still really ought not trust him this much. As mentioned, the Sinestro title at least fares better conclusion-wise than Bunn's Lobo, when ends on a more unresolved cliffhanger. Lobo was more related to Sinestro in Sinestro Vol. 3: Rising, totally unrelated here, and so it's a boon even that DC collected these issues. And for better or worse, it seems Bunn was starting with these issues to deal with Lobo's trauma after having been raped by a rival mob boss in Lobo Vol. 2: Beware His Might, problematic as that story was -- but, and this is part of the problem, the cancellation of the Lobo book means Bunn never gets to raise the storyline above shock value if he had intended to do so. Instead, in these two issues a hallucinating Lobo basically kills everyone he can find, including a potential ally, and spars with the trenchcoat-wearing Hal Jordan for a bit, and that's it. Good that the issues are here, but no great resolution for Lobo. I'd be remiss not to also mention a brief interaction that Cullen Bunn includes between Arkillo and Blue Lantern Saint Walker, who'd been captured and tortured by the Sinestro Corps but who also, way back in Green Lantern: New Guardians at the beginning of the New 52 had been a teammate of Arkillo's. Just about everyone's forgotten about that by now, but Bunn didn't, and the callback is both poignant as a scene and also because it comes so close to the end of DC You, being the end of the New 52 continuity. I have not been pleased with all I've read from Bunn, but Sinestro Vol. 4: The Fall of Sinestro is by far the masterpiece of his contemporaneous DC You tenure, certainly a book that should please fans of the title character. How does Bekka fit into all this? As a devout disciple of the Fourth World, I’m curious why she hangs around after Godhead. Due most likely to Sinestro's unexpected cancellation, I wouldn't say Bekka's arc gets resolved necessarily. But she's depicted as having a (downplayed) romantic interest in Sinestro and vice versa. For her, I think it's that Sinestro is not affected (or as affected) by Bekka's subconscious power of affection as everyone else is; for him, I think Bekka's ability to inspire both love and fear in those around her represents what Sinestro strives for (if not necessarily achieves). There's more of Bekka in the third volume than in this one.